Since I started applying these rules in my life I have been a lot happier and more at peace with myself. We only live once so let this experience we call life be one of the greatest journeys we travel. Eat food & be Merry. Have fun with your family & friends. Watch movies & play games. Whatever you do, have a great day and much love to you all. We are entering the New Year. The New Year represents change and a new start in life. We have all made mistakes in life, let us learn from them and not dwell on them. Move forward into the New Year with a new mind set striving to be the best at everything you do. Merry Christmas & a Happy New Year to you all. 2013 is yours….. If you don’t design your own life plan, chances are you’ll fall into someone else’s plan. And guess what they have planned for you?….. Not much. I’m just a human being being human! Hello boys and girls. We are getting closer and closer to Christmas and already people are telling me the pounds are slowly creeping on LOL. It’s all good though, treat yourself’s but slow down on the ice cream everyday. 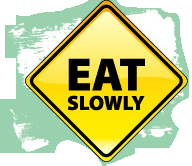 Tip #4 today is – Eat Slower. Did you know that it takes around 20 minutes for your brain to register that you’re full. I’ve covered this before but I’ll cover it again for those who missed out. Just slow it down a little. Take your time and chew the food slowly, no need to pig out. Appreciate the aroma’s and the flavours of the seasonings that bind together so wonderfully. Just by eating slower you will realise that you don’t actually need so much food. You will avoid over eating which leads to the inevitable weight gain. 1) Lose weight – A growing number of studies confirm that just by eating slower, you’ll consume fewer calories — in fact, enough to lose 20 pounds a year without doing anything different or eating anything different. 2) Enjoy your food – This reason is just as powerful, in my opinion. It’s hard to enjoy your food if it goes by too quickly. In fact, I think it’s fine to eat sinful foods, if you eat a small amount slowly. Think about it: you want to eat sinful foods (desserts, fried foods, pizza, etc.) because they taste good. But if you eat them fast, what’s the point? If you eat them slowly, you can get the same amount of great taste, but with less going into your stomach. 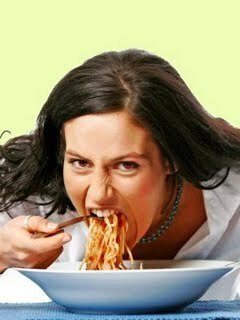 3) Better digestion – If you eat slower, you’ll chew your food better, which leads to better digestion. Digestion actually starts in the mouth, so the more work you do up there, the less you’ll have to do in your stomach. This can help lead to fewer digestive problems. 4) Less stress – Eating slowly, and paying attention to our eating, can be a great form of mindfulness. Be in the moment, rather than rushing through a meal thinking about what you need to do next. When you eat, you should eat. This kind of mindfulness will lead to a less stressful life and long-term happiness. 5) Rebel against fast food and fast life – Our hectic, fast-paced, stressful, chaotic lives — the Fast Life — leads to eating Fast Food, and eating it quickly. This is a lifestyle that is dehumanizing us, making us unhealthy, stressed out, and unhappy. We rush through our day, doing one mindless task after another, without taking the time to live life, to enjoy life, to relate to each other, to be human. That’s not a good thing in my book. Instead, rebel against that entire lifestyle and philosophy … with the small act of eating slower. Don’t eat Fast Food. Eat at a good restaurant, or better yet, cook your own food and enjoy it fully. Taste life itself. If you are a fast eater, after reading this, will you slow down….. This is the video that got me into this guy – I found it last year but I still watch it every now and again. I only share the best with you guys – Enjoy.